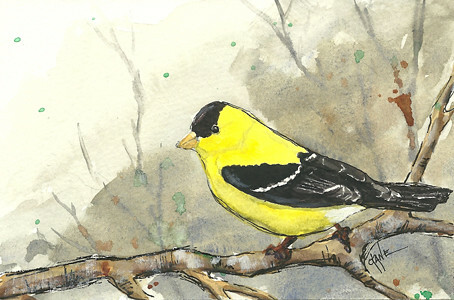 American Goldfinch Painting and Video – Let's Paint Nature! The American Goldfinch is a happy bird. Or should I say, the one who admires the goldfinch is the happy one? Maybe a little of both. I have a thistle feeder in my backyard, far enough away from any other feeder (goldfinches like their space). Many fly in on their “roller coaster” patterns and gather around to eat and sing their sweet song. So amazed by their beauty, I decided to make a small watercolor painting. The abstract background helps to keep the focus on the goldfinch and create a nice texture. I hope I have kept his peppy little spirit within this painting. Very lovely. Despite being inundated with dozens of them over-Winter, we don’t get to see their lovely color. Just as they start to get the breeding colors, off they go. Lana: I know what you mean about the drab color. I have them all year long . I assumed they were the same ones, but read that my summer goldfinches probably fly further south and the ones I get in winter are probably from the north. Funny, I never realized.